OFF LIMITS! Spray by NaturVet is a special combination of natural herbs that creates an invisible shield to keep animals from treated areas. 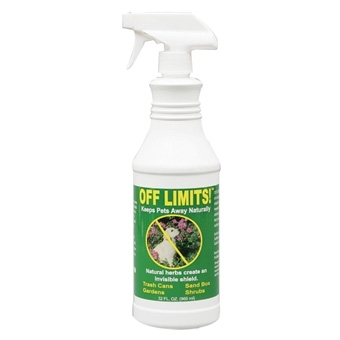 Keeps pets away Naturally. OFF LIMITS! is non-staining and easy to use. Safe for use on plants and grass. OFF LIMITS! Spray by NaturVet is made in the USA and has a 100% Money Back Guarantee!